The first step in joining the Keepers of Earth Medicine Web Ring is to complete the submission form below. It gives you your id number that you will need to place on your web Ring page. It also gives you your password so that you can edit your webring page if you need to change any information that has been entered. Then you must add the Ring's code to your web page, inserting the id number that you were given. 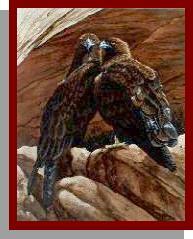 The final step is to copy the image file of the eagles on this page and make sure you upload it to your web site. "Click here" to go to the "Keepers of Earth Medicine" Web Ring code page where you can copy the code. You have 2 weeks to complete your page, during which time you are placed in the rings queue. If you do not finish it by the end of two weeks you are automatically deleted and must reapply if you still wish to be a part of the ring. When you complete these steps we will go back and check your final page. Once your page is approved you will receive an E-mail notification letting you know that you have been accepted to the ring. Our Ring is new, therefore very small, but we will be very selective about who will be placed in the ring. The sites that will be chosen will follow our current theme and philosophies. This Web Ring is designed to bring a group of people together who have a desire to share their customs, wisdom, knowledge, ideas and beliefs.... knowing we are all teachers in our own respects, and we all learn from each others life's lessons. Thank you for your interest in Keepers of Earth Medicines' Webring. on your form Click here to edit.